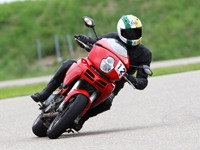 Multistrada.net is a community dedicated to the Ducati Multistrada and it's owners. We aim to be a fast, easy and stable way to share information with fellow enthusiasts. A lot of people picked up on this and by now, our forums hold a wealth of information that's not likely to be found anywhere else. Multistrada.net is an open community, for enthusiasts, by enthusiasts. We are completely independent, not affiliated to Ducati or any other company, so we don't have to answer to anybody. Most of the site is open to anonymous visitors, including the "Wanna buy" forum. If you want to access the other forums you'll need to register. The Ducati Multistrada was first introduced on the Milan motorshow in the fall of 2001. For Ducati it was quite a radical departure from the existing models - or any existing model from other manufacturers for that part. 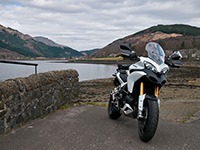 Ducati presented the Multistrada as a new bike for a real rider - for someone who wants to be riding as often as possible in as many challenging conditions as possible, whether roaring up mountain roads, commuting to work, taking a trip to the beach, or riding around town, this bike provides a total riding experience with style and performance. The bike was received with some mixed emotions, particularly it's odd looks. One year later as the second prototype was presented on the Munich Intermot, it became obvious that Ducati was serious about the bike and its styling. 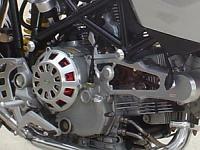 Only details had changed since the first prototype and the bike was now 80% production ready and stil on schedule for introduction in march 2003. The demand for the Multistrada surprised even Ducati. The Multistrada will go into the Ducati recordbooks as having the highest number of registrations, in the shortest period of time for a new model. In it's first year the production target was eventually set at 5,500 bikes, meaning that about 17% of the bikes leaving the Bologna factory is a Multistrada. Multistrada.net is proud to be a member of the Desmo Owners Club, a colorful collection of clubs and people, sharing their passion for the Italian brand.